UPDATE: The Wyatt Tee Walker Syposium scheduled for Thursday has been cancelled. The event is slated to be rescheduled at a later time. The University of Richmond School of Arts & Sciences will host the Wyatt Tee Walker Symposium Sept. 13 from 2-7:30 p.m. in the Jepson Alumni Center. The event is free and open to the public, and attendees are welcome to attend any portion that fits their schedule. Programming will focus on celebrating the life and legacy of Walker, a distinguished theologian and civil rights leader, who served as chief of staff for Martin Luther King Jr. and executive director of the Southern Christian Leadership Conference. Walker, who passed away in January, gifted his personal collection to the University of Richmond Boatwright Memorial Library. The collection includes hundreds of historical pieces, including papers, recorded sermons, and memorabilia. The library continues to process and catalogue the collection, which will be available for research. 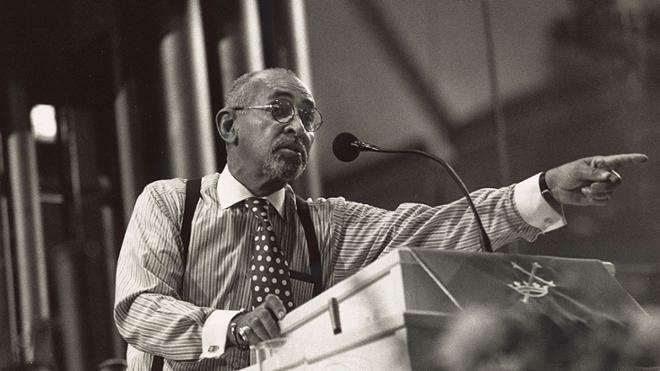 The Walker Symposium will include a sneak peek into the donated materials beginning at 2 p.m., a panel discussion at 3 p.m., and a keynote lecture by Reverend Joseph Evans, Dean of Morehouse School of Religion and close family friend, at 6 p.m. The complete agenda is available online. The Walker Symposium kicks off a series of themed programming called “Contested Spaces: Race, Nation, and Conflict,” which focuses on conversations centered around conflict resulting from ethnic, racial, and cultural differences.